Following several years of negotiations the Burmese (Myanmar) government finally opened up access to its waters in 1997 thus opening the door to countless unexplored and pristine dive sites. It truly is one of the last remaining diving frontiers on the planet. The Mergui Archipelago consists of over 800 islands, some of them the size of Singapore or Phuket and most of them uninhabited, the only dwellers on these waters are a few local sea gypsies. Despite the governments pressure to protect the archipelago evidence of dynamite fishing can still be found. However the authorities have finally awoken to the power of the tourist dollar and have consequently outlawed dynamite and shark fishing in the area. There is also an entrance fee to the area and all boats enter and depart via Kawthaung (Ko Song or Victoria Point are other names for it), just west of Ranong, Thailand. Diving here is simply awesome with great visibility, sharks and manta rays, and pristine coral reefs it offers only the best. See this article for more info on diving in Mergui. 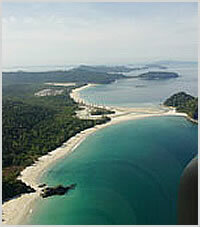 Geography : Hundreds of inshore and offshore islands and reefs. Highlights : Untouched dive spots, great visibility, sharks and marine life. Average cost of a dive : liveaboard only.